This exhibition serves foremost as a celebration of the history of Artadia in San Francisco. The ten artists whose works are included—John Bankston, Rebeca Bollinger, Castaneda/Reiman, Enrique Chagoya, Desirée Holman, Guy Overfelt, Brion Nuda Rosch, Sergio De La Torre, and Richard T. Walker—are all Artadia San Francisco Awardees who still live and work in the Bay Area. The exhibition spans three spaces at Minnesota Street Project: Galleries 200, 201, and the Atrium. Artist Desirée Holman’s closing event will take place on Saturday, September 24. San Francisco has always been a major center for social, cultural and economic change. At the time when Artadia was founded (1997) and began giving awards (1999), San Francisco was just going through the first dot com boom and bust. Many artists were getting pushed out of the city because of the high costs of living. The Artadia Award gave many artists the chance to continue their practice, and continues to do so today. As we are experiencing another moment in the Bay Area where the tech industry is booming and changing both the socio-cultural fabric and the economic realities in the city, artists are once again affected by and responding to what is happening around them. The artists in this exhibition are particularly interested in investigating, appropriating, and in some cases challenging, historical truths by emphasizing personal narratives. As a result, their works present a distorted reality where the real fuses with the unreal, and where absence plays as important of a role as presence. In the Atrium, Brion Nuda Rosch (2009 San Francisco) presents a series of newly commissioned sculptures composed of several layers of found materials that suggest the presence of abstract body-like forms and a variety of art historical references. Distributed throughout the exhibition spaces are four small paintings by Guy Overfelt (2001 San Francisco). Interested in having an element from American underground culture reproduced in a context far removed from it, the artist hired craftsmen in China to make painted reproductions of four flyers from punk concerts in the 1980s. Rebeca Bollinger (2001 San Francisco) presents a series of photographs that depict an unusual grouping of belongings of a relative who suffers from Alzheimer’s, combined with other images that depict an equally disorienting mixture of appropriated imagery and fragments of her ceramic works, which are also present in the show. Finally, a video from 1994 presents a scrolling list of the 644 keywords that CompuServe related to the images included in an early online photography forum. This exhibition borrows the first three words that appear on the list as its title: above accents across. Richard T. Walker’s (2009 San Francisco) neon sculptures interweave sound into landscape, and vice-versa, recalling fragments of personal memories and desires. The juxtaposition of bright fragile neon lights with rocks, large glass panes, and the sound of a single sharp note creates both a constant balance and tension. The duo castaneda/reiman (1999 San Francisco) present commissioned sculptural interventions responding to two of the gallery spaces at Minnesota Street Projects. Bringing together digitally printed imagery with construction materials, their new sculptures suggest the story of a space that either existed in the past or might exist in the future. By appropriating Goya’s Caprichos series, Enrique Chagoya (2005 San Francisco) revisits the socio-political metaphors represented in these prints from the late 18th Century, altering subtle elements to highlight how these images are still relevant today as the human experience transcends through history. John Bankston’s (2001 San Francisco) work gravitates around the episodes of the life of Mister M, a Black male character the artist invented. Using the aesthetics of coloring books, the artist created an ongoing visual novel that begins when Mr. M is captured and taken to the “Rainbow Forest.” Each of his drawings and paintings presents one of the many encounters Mr. M. has while making his way through this new world. Sergio De La Torre’s (2007 San Francisco) new video work, shot on a desolate Italian beach, shows a line of bollards made of overturned sand buckets. This absurd gesture creates a symbolic barrier that prevents access from land to water and water to land, but is ultimately an effort that can only be ephemeral. Created in collaboration with Barbara Chiloiro and Pancrazio De Padova. As a closing event, Desirée Holman (2007 San Francisco) will be in conversation with Li Rao Wright, her Mandarin tutor, with whom she will be discussing (in Mandarin and in English) the particularities they both encounter when trying to communicate, and all that is transformed or lost in translation. I am a middle-aged American with an English mother tongue with no other fluent language knowledge. Two years and a half years ago, I began to avidly learn Mandarin Chinese. Li Rao has been my Mandarin language tutor for around two years. We meet weekly to converse in Mandarin for an hour. By sharing one of our weekly meetings in the gallery, our session allows viewers a glimpse into our shared process. 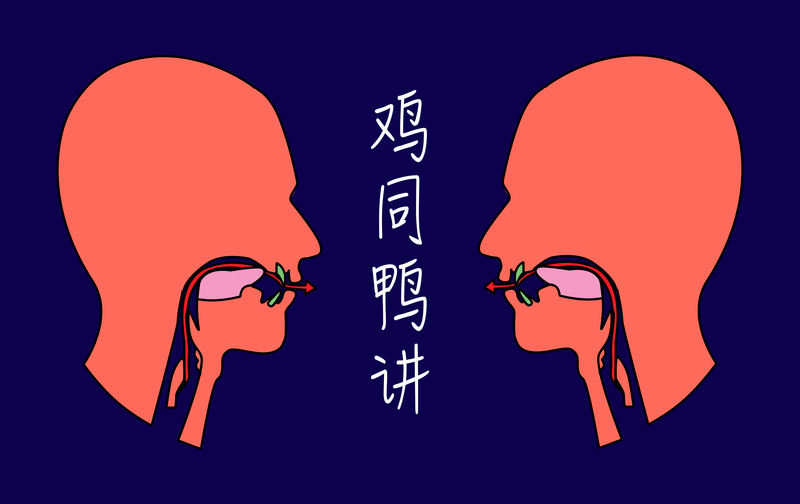 샷谿羈쉿：Chicken with Duck Speaking explores the experiential space of language acquisition in the literal and metaphorical transition between fluent English and learned Mandarin. “Third Place” (Kramsch 1993) in language learning refers to the construction of a new hybrid space between the source language and the target language. As students become a more integral part of their target language learning community, they start talking within (and not only about) the practice they are involved in. My work at large continues to be engaged with the states of change, mutability and flexibility of identity as expressed internally and externally, and the domain of language in this exercise of world-building and self-construction is a natural extension of these inquiries. Thematically, in making this work, I seek to explore the process of de-centering or, simply stated, taking a step back from the learner’s beliefs and thoughts to engage with another cultural framework, and to ultimately occupy the “third place”. This process ultimately allows questions about one’s own culturally-determined assumptions and about the the society in which one lives. Juana Berrío is an independent curator and writer based in San Francisco. She co-founded and directed Kiria Koula, a contemporary art gallery and bookstore that was located in The Mission District in San Francisco. She has worked as an Education Fellow at the New Museum in New York (2012) and at the Walker Art Center in Minneapolis (2010-2011), and served as a curatorial assistant for Massimiliano Gioni (2013 Venice Biennale). As an independent curator and writer, she has been a contributor for Frog magazine, Bielefelder Kunstverein, SFMOMA’s Open Space, Kadist Foundation (Paris), and Look Lateral, among others. She is currently working as the San Francisco Head of Local Programming and Development for Untitled SF, 2017. Kelly Huang joined Zlot Buell + Associates as an Art Advisor in 2009. She works directly with private and public clients in all aspects of their collecting needs—from advising on purchases to handling museum loans and overseeing installations. Previously, Kelly worked as a Curatorial Assistant at The Renaissance Society, Visiting Gallery Manager for Gallery 400 at the University of Illinois at Chicago, and as Photo Editor for The Atlantic magazine. She is a co-founder of Artadia’s San Francisco Council. She has also been a regular columnist for Art21 Magazine. Located in San Francisco’s historic Dogpatch district, Minnesota Street Project offers affordable and economically sustainable spaces for art galleries, artists and related nonprofits. Inhabiting three warehouses, the Project seeks to retain and strengthen San Francisco’s contemporary art community in the short term, while developing an internationally recognized arts destination in the long term. Founded by entrepreneurs and collectors Deborah and Andy Rappaport, Minnesota Street Project was inspired by the couple’s belief that philanthropic support for the arts today requires an alternate model—one suited to the innovative nature of Silicon Valley and the region as a whole. Their vision of a dynamic, self-sustaining enterprise that shares its economic success with arts businesses and professionals aims to encourage heightened support for the arts from newcomer and established patrons alike. Artadia’s programs in San Francisco are made possible by The Fleishhacker Foundation, The San Francisco Foundation, IfOnly, Artadia’s dedicated Board of Directors, Council members, and many generous individuals throughout the country.